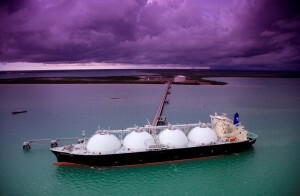 Origin Energy has announced that its Australia Pacific LNG project on Australia’s east coast has commenced production, with the first cargo of liquefied natural gas expected to be shipped by the end of the year. In an ASX Announcement issued last week, Origin said that production began at the Curtis Island facility. The $25 billion project – a joint venture between ConocoPhillips (37.5%), Origin Energy (37.5%), and Sinopec (25%) – will convert CSG to LNG. “With first LNG production, Australia Pacific LNG has now achieved its last major milestone prior to exporting LNG to customers in Asia. The Origin-operated upstream activities which deliver gas to Curtis Island are fully operational and performing well, and Origin, together with partners ConocoPhillips and Sinopec, are now focused on achieving first export,” said Origin Chief Executive Officer Integrated Gas, David Baldwin. The project’s upstream production and pipeline system is operated by Origin Energy. ConocoPhillips will operate the downstream LNG facility on Curtis Island near Gladstone, Queensland and the LNG export sales business.